In all honesty it’s a fair question. Of the major professions that require a licensure, architecture is the most unclear. Lawyers. Doctors. Therapists. Engineers. 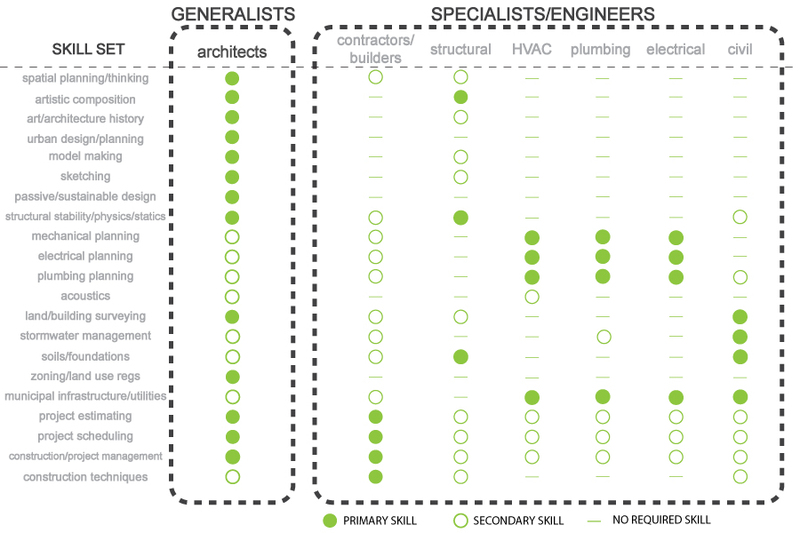 When thinking of these occupations most have a pretty good idea what each does.When thinking of an architect, that’s when things become a bit ambiguous. Begin to think of your own pre-conceived assumptions of what an architect is. Almost certainly it would be either a person who “draws” buildings or a person who “builds” buildings. Both descriptions are equal parts true and incorrect. But I’ll save that argument for later. In any case it’s best we start by detailing what an architect is,...for real. The word ‘Architect’ originated in the Greek language as 'Arkhitekton'. Arkhi- meaning ‘chief’ and Tekton meaning ‘builder’, translates to “a chief builder”. The Latin progression of the word, 'Architectus', means “master builder” or a “director of works”. Notice there is no mention of anything relating to drawings. This suggests that architects have ancestral roots in building things rather than drawing them. For millenia this was the universal understanding of an architect’s role in bringing physical form to a society. The monuments of antiquity were built from a combination of skilled and slave labor. 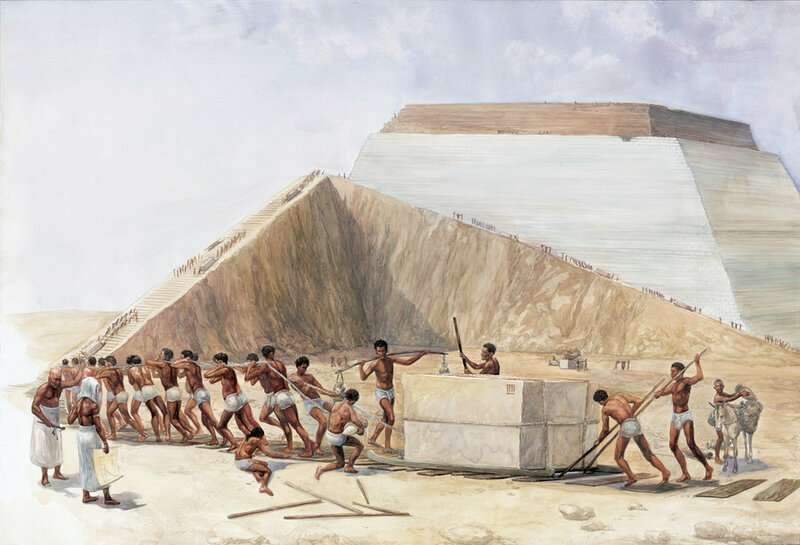 This painting shows skilled Egyptian craftsmen quarrying, shaping, and transporting stones as well as making mud bricks. These ancient tradesmen were some of the first 'architects'. Ancient monuments were often the visions of rulers and their "master builders". What we would call drawings today, did not exist in the time of the ancients. The masterpieces they left behind are the result of trail and error. Architects in these days were infact builders and coordinators of skilled tradesmen. Today, architecture can be very difficult to grasp by most people because it is a convoluted and subjective profession. Unlike other professions, architecture is not a precise endeavour. There is never one concise answer. There are always many possibilities. It is an artistic expression, but it is also a scientific investigation. It is practical, but it is also allegorical. Merriam-Webster defines 'Architect' as “a person who designs buildings and advises in its construction.” But, even this definition is a bit vague. Interpretations like this fuel the stereotype that all architects do is “draw pretty pictures" which could not be further from the truth. The aesthetics of a building are indeed the most enjoyable part of the job. But beauty is just one of many things architects must consider when designing space. It is often subordinate to other matters more functional, economic, sustainable and regulatory. Design of any kind is the cyclical process used to solve a problem. It consists of two primary streams of thought: Analysis and Execution. Analysis is a cognitive process where information relating to a problem is discovered and collected. Execution is the act of making educated decisions based on the analysis. It is the process of doing and testing possible solutions. In order to refine solution(s), proposals are thrown back into the design loop and analyzed again. The process repeats itself until the designer feels a sufficient solution is reached that satisfies all defined analytical criteria. The Architectural Design Problem is uniquely complex. Architects apply design methodology to each part of a building’s production, improving one issue at a time. There are many pieces of information that must be gathered before initial solutions can be proposed. The architect’s legal and moral duty to the general public is paramount. A licensed architect has a civil duty to ensure the health, safety and welfare of the general public and building users. This requires architects be knowledgeable and competent in a host of public health and safety restrictions: building codes, fire codes, energy codes, mechanical codes, ADA regulations (American Disabilities Act), FHA laws (Fair Housing Act requirements), sustainability codes and more. Regardless the project, architects are completely responsible for upholding this civic mandate. One of the first things architects do is try to decipher what a client needs and wants. They question and interview the client, teasing out all important project requirements turning them into design guidelines. Then the analysis continues. In addition to life safety issues, architects must know private property and zoning statutes. Depending on the area the architect will often deal with special regions like historic districts which apply even more design constraints. Gathering information on surrounding ecology, climate, infrastructure and utilities is also an important task for the architect. This information will influence how a building fits and functions on a site. The architect is an estimator, economist, and time manager making sure projects can be built within budget & schedule. After all pertinent information is uncovered, design solutions of space and visual beauty can finally be proposed. But the aforementioned analysis remains the filters the design must constantly be tested against to produce a successful solution. Arguably the most significant role of an architect during the design process is the task of coordinating consultants, engineers and contractors. Here is where the architect’s unique training is invaluable and irreplaceable. Why is it the architect’s job to coordinate and organize the work of other competent professionals? Because these are specialized disciplines that focus on one aspect of the whole work. Structural engineers concentrate on structural matters. Civil engineers are concerned with infrastructural matters. And so on and so forth. Their training is extremely valuable but one-dimensional. They are by definition “specialists”. Note that this diagram is assuming a standard formal education and expereince as a baseline for criteria and is not relfective of the certain nuances that obviously exist between these disciplines. The role of the architect is not that of a specialist. Their training consists of all the previously mentioned disciplines and more. They are trained to foresee the entire system rather than one individual part. This makes the architect better equipped to lead the development of the entire project. Architects coordinate all the separate building sciences into a comprehensive whole, directing how the disparate parts visually and physically fit into space. Space. This word gets to the real essence of architecture. The ability to visualize and think spatially is a trait deeply embedded in the psyche of an architect. Architects ‘create’ and move space around - as if it could be grasped - to accommodate all the different restraints and components associated with producing a building. Architects do all this while simultaneously crafting the subjectively aesthetic style and look of a building. This sort of spatial “wizardry” along with a multi-disciplinary training is what distinguishes architects from other designers, professionals and construction occupations. So what is an architect you say? An architect is a generalist; aploymath; a “jack of all trades” so to speak. Architects are concerned with the artistry of a building, but also the science of a building. Architects are coordinators and orchestrators. Architects are creators. Architects have an innate ability to manifest buildings and spaces in the mind as concepts and metaphors first. Through the process of design these concepts become reality. Architects are leaders, galvanizing many entities to achieve a single goal. Think of the architect as Doctor Richard Weber, from the TV drama, Grey’s Anatomy. Dr. Weber, is a general surgeon. That means he is very proficient in a variety of surgical procedures across many surgical fields. He can effectively participate in cardiological surgeries, neurological surgeries, cosmetic, trauma and orthopedic surgeries as well. This makes him extremely valuable to the surgical team and the hospital. It makes him indispensable. Which is why Dr.Weber is(was) the Chief of Surgery for the entire hospital. It is Dr. Weber’s duty to be concerned with all fields of surgery in order to ensure that the hospital as a whole thrives and succeeds. What better person to lead a comprehensive surgical program than the person who is most knowledgeable in all forms of surgical thought and procedure. In the same way Dr. Weber directs the complex workings of a hospital, so too does an architect direct the vast complexities associated with designing, constructing and maintaining a building.